Refugee Agencies Race Against Time To Beat Trump Immigration Ban : Parallels Immigration and refugee advocates say the details of President Trump's executive order are still in flux. Some travelers have been barred from entering the U.S. Others are receiving exemptions. Protesters at Los Angeles International Airport rally Sunday against President Trump's executive order halting entry of refugees and others into the U.S. Refugee advocates and resettlement groups spent a chaotic weekend struggling to adapt on the fly, with families in the air and no official guidance on President Trump's executive order that bans refugees from around the world. "There's no way to get guidance, nothing is coming down from the top. 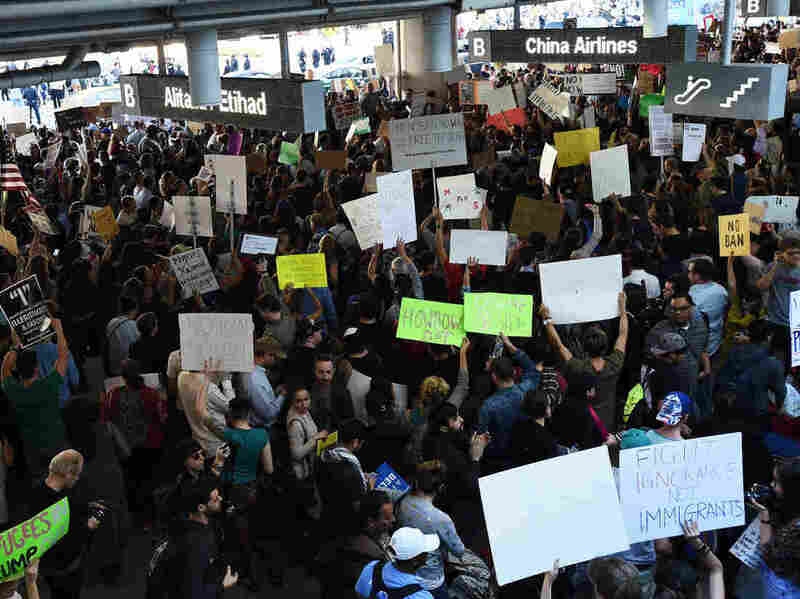 It was chaos at the airports," says Melanie Nezer, the vice president of policy and advocacy of HIAS, a global Jewish nonprofit that protects and resettles refugees. Her group tried to intervene in individual cases over the weekend. By Sunday, advocates said they had received State Department assurances that some refugees already in the pipeline will be admitted through this Friday, extending the deadline by one week for those with travel documents — "refugees in transit," says Nezer. The extended deadline hasn't been announced officially yet, adding to the uncertainty of a process that seems to change by the hour. The extended deadline could allow entry to around 800 refugees, "but not refugees from the seven countries," says Nezer, referring to a presidential order that blocks citizens of seven Muslim-majority countries from entering the U.S. for 90 days: Iran, Iraq, Libya, Somalia, Sudan, Syria and Yemen. More than 50 percent of Muslim refugees admitted to the U.S. last year came from Syria and Somalia. An email circulating among official resettlement agencies and obtained by NPR says those arriving this week "will be allowed entry to the U.S." But the State Department has not confirmed a change publicly. The shifting application of Friday's presidential executive order underlines the ongoing confusion and comes after a weekend of panic for refugee families who had waited years to clear security checks for resettlement in the United States — only to be detained or deported upon arrival. "We have two cases next week; now we are hopeful," Nezer says. Refugee agency officials say they are sending legal teams to the airports in case of detentions. Chris George, who heads IRIS, a refugee resettlement office in New Haven, Conn., told NPR in an email that he was alerted by Church World Service, one of IRIS's partners, to expect arrivals this week from Afghanistan and Colombia. One refugee whose future is at stake is 17-year-old Sardar Hussain, an Afghan orphan who has waited for years for resettlement. The Taliban killed his entire family when he was 13. The Lutheran Community Services in Spokane, Wash., finally accepted him in a program for unaccompanied minor refugees. "I am very worried," Heike Lake, with the Lutheran group, said late Friday. She feared Hussain would be barred from a Monday flight to the U.S. But Lake was alerted late Sunday that the State Department's extension for refugees in the pipeline would apply to Hussain, who is now expected to arrive in Spokane on Monday and will become a resident in a foster home. The State Department's deadline extension could give a reprieve to some 800 refugees who will be resettled in the United States, refugee advocates say. Then the program will be frozen for 120 days. After a weekend of nationwide protests, criticism from faith-based groups and some backlash within the Republican Party, President Trump defended his order, saying the U.S. will show compassion to those fleeing oppression. But he insisted that he is "protecting our own citizens and border." He argued that his policy is not a Muslim ban, "as the media is falsely reporting," but "about terror and keeping our country safe." "The Muslim ban is in effect," counters HIAS President and CEO Mark Hetfield, reached by phone on Sunday at a pro-refugee rally in Washington, D.C. He believes the executive order "killed the refugee program" and says, "We are making a lot of noise. We are going to try to litigate it." On Saturday, a federal court for the Eastern District of New York issued an emergency stay for travelers with valid green cards and visas, but the order did not come in time for some refugees, Hetfield says. Hetfield tried but failed to intervene on behalf of a Syrian mother traveling with two young children. She had been granted approval to join her husband in Connecticut after a three-year separation. "She went through all the vetting," Hetfield says, and boarded a trans-Atlantic flight before the order was signed on Friday. But she was prevented from taking a transit flight in Kiev after the order became official. "So now, she's stuck with no legal recourse," Hetfield says. "It's incredibly cruel. I don't recognize this country." A HIAS-run program to resettle religious minorities from Iran is also on hold, Hetfield says. "It's not high-profile; the majority are Christians," he said, with around 2,000 people resettled every year for the past two decades. But Iran is one of seven countries from where visas are now blocked. But the official resettlement tally shows the number of Christian refugees is roughly equal to Muslims. The president carved out an exception for religious minorities in his executive order. "They've been horribly treated," Trump said in an interview with the Christian Broadcasting Network on Friday. "If you were a Muslim, you could come in, but if you were a Christian, it was almost impossible." But the "Christian exception" still has to be approved by the secretary of state and Department of Homeland Security on a "case by case" basis, Hetfield said. The impact of the executive order has already been profound on individual lives — from the Iraqis who worked for the U.S. military and intelligence services to a Sudanese doctor at the Cleveland Clinic who was barred from re-entry to the United States on Friday. A Syrian clarinetist, a legal immigrant touring with cellist Yo-Yo Ma, does not know if he will be able to return to his Brooklyn apartment at the end of the tour.